Background & objectives: Despite a tremendous expansion in the financing and coverage of malaria control programmes, the disease continues to be a global health threat. This study was conducted to assess the entomological parameters of anopheline mosquitoes, viz. species composition, abundance, longevity, behaviour and infectivity rates in Kersa district, Jimma zone, southwestern Ethiopia. Methods: Mosquito collection was carried out from each selected household in each of the nine selected study villages of Kersa district, using CDC light-traps and pyrethrum spray catches (PSCs) for seven months (June to December 2014). Mosquito count data were log transformed before analysis and the data were analyzed using SPSS software package version 16.0. Analysis of variance (ANOVA) was employed to compare means and Tukey’s post-hoc test was used for mean separation. Results: In total, 1559 adult female anopheline mosquitoes, representing at least three species were collected from the study villages. Of these, 1122 were collected by CDC light-traps and the rest 437 were collected by PSCs. Anopheles gambiae s.l. (71.8%) was the most abundant species, followed by An. coustani s.l. (22%) and An. pharoensis (6.2%). The mean monthly density of anopheline mosquito species was highly significant (p < 0.001). Significantly (p <0.05) higher population of An. gambiae s.l. were trapped indoor than outdoor. However, outdoor mean densities ofAn. pharoensis and An. coustani s.l. were significantly (p < 0.001) higher than indoor mean densities. The longevity of An. gambiae s.l. was higher in the months of June, July and August (mean 7.32 days) and lower in the months of October, November and December (mean 2.94 days). Two An. gambiae s.l. specimens were found positive for Plasmodium vivax 210 polymorphs and the overall infectivity rate was estimated to be 1.04%. Interpretation & conclusion: This study could contribute to the understanding of anopheline mosquitoes with respect to their composition, dynamics, distribution and behaviour in Kersa district, for evidence based malaria vector control programmes, mainly in the appropriate timing of the indoor residual spray programme. Despite a tremendous expansion in the financing and coverage of malaria control programmes that has led to a wide-scale reduction in malaria incidence and mortality, the disease continues to be a global health threat; and has resulted in 429,000 deaths from the estimated 212 million cases in the year 2015, alone. Furthermore, only 59 out of 103 countries with ongoing malaria transmission are on the track of meeting the Millennium Development Goal (MDG) target of reversing the incidence of malaria; among them 52 were on the track of reducing malaria case incidence rates by 75% till 2015. Considering substantial reduction of global funds for malaria control and elimination in recent years and the overwhelming growing evidence of antimalarial drug resistance combined with insecticide resistance of vectors, there is no assurance that the recent gains achieved in disease control cannot be thrown away cheaply. The disease remains a long-standing problem in Ethiopia, where all the four human malaria parasites are prevalent in the country, with Plasmodium falciparum being the most widely distributed and dominant parasite species, followed by P. vivax, P. malariae and P. ovale. In Ethiopia, approximately 75% of the total area is estimated to be malarious, with 68% of the total population being at risk of infection. Malaria transmission peaks twice in a year, from September to December and April to May, and the transmission is unstable where major epidemics occurs due to climatological anomalies. Anopheles arabiensis, member of An. gambiae complex, An. funestus group, An. pharoensis and An. nili, are widely distributed anopheline vector species in the country, with former being the primary vector,,,,. Disease control strategy in Ethiopia includes advocacy, community mobilization, and communication activities for behaviour change in all populations to household level, creating demand for interventions and utilization of services through health extension workers (HEWs),,. Furthermore, the Government of Ethiopia has set an ambitious national goal in 2005 to provide 100% coverage of insecticide treated nets (ITNs) in malarious areas, with a mean of two ITNs per household; to scale-up indoor residual spraying (IRS) in households with insecticide, to cover 30% of households targeted for IRS; and scale-up the provision of case management with rapid diagnostic tests (RDTs) and artemisinin-based combination therapies (ACTs),,,. However, decreased sensitivity of parasites to drugs,, decreased susceptibility of vector(s) to public health insecticide(s),,,,,,,, the behavioural plasticity of vector mosquitoes following the application of long-lasting insecticidal nets (LLINs) and IRS,,, and residual transmission that is acquired mainly through, out-door or early biting could jeopardize the envisaged disease control and elimination programme. In addition to this, better understanding of local malaria vector behaviour, their ecology and microclimate would permit a better understanding of malaria transmission in one particular set up in order to optimize control strategies aimed at reducing man-vector contact. Such critical information can be obtained through longitudinal monitoring and evaluation of vector population before and after the application of control measures such as LLIN and IRS. Therefore, in this study an entomological assessment regarding anopheline mosquito composition, abundance, parity rate, longevity, resting behaviour, infectivity rates and other entomological parameters were carried out pre- and post-IRS operation in Kersa district, southwestern Ethiopia. The study was conducted from June to December 2014 in Kersa district, southwestern Ethiopia. It is located in the southwestern part of Jimma zone, Oromia regional state, 333 km southwest of Addis Ababa. The study area lies between latitudes 7°35’-8°00’ N and longitudes 36°46’-37°14’ E. The altitude ranges between 1740 and 2660 m above sea level. The district is malarious; the ecological condition in the district favours the existence of Anopheles mosquitoes responsible for malaria transmission. Malaria is the most prevalent seasonal disease in the area accounting for 77.1% of all the reported diseases in the health center during 2006 and 2007. The district has more or less homogenous characteristics of house style with walls made of wood and mud plastered and roofs covered with grass. The community practice similar persistent agricultural socioeconomic activity, and majority of them are Oromo ethnic. Out of 32 “Kebeles” (smallest administrative unit in Ethiopia) that existed in the district, 20 of them are categorized as highly malarious, 10 as mild and two as malaria free district (District Health Office). A longitudinal study was conducted using entomological parameters such as Anopheles species composition, density, vector population dynamics, behaviour, longevity and vector infectivity in nine villages selected from three sentinel sites in Kersa district of Jimma zone, southwestern Ethiopia. In Ethiopia, there is routine annual national spray programme and distribution of LLINs as part of vector control interventions, with replacement of LLIN being done every three years. Intervention campaign usually start in the second half of August and last for 1 to 2 months. At this particular study site, bendiocarb (0.4 g/m2) has been used for indoor residual spray and LLINs (PermaNet 2.0) have been distributed since September 2013. The dynamics of vectors was monitored from the month of June to December 2014. Three “Kebeles” namely Bulbul, Gelo and Ankaso were selected randomly from 20 highly malarious “Kebeles”. A total of nine villages (three from each “Kebele”) were used for entomological assessment. A total nine houses were randomly selected (one per village) for whole night light-trap collections (LTCs) using the Center for Disease Control and Prevention (CDC) light-traps (Model 512; John W. Hock Co., Gainesville, FL, U.S.A.). Adult female Anopheles mosquito collections were carried out indoor and outdoor in each of the selected houses twice a month from June to December 2014. The CDC light-trap was set to run between 1800 to 0600 hrs and was set inside the bed room (untreated bednet were also provided to the inhabitants), whereas outdoor collection was set in the radius of 15–20 m surrounding the indoor collected houses or nearby cattlesheds. Pyrethrum spray catch (PSC) was employed to collect indoor resting Anopheles mosquitoes from 0600–0730 hrs in 60 houses, 20 from each of three villages namely, Sarado, Waddeyi and Warsu which were different from those used for LTCs. Anopheline mosquitoes were sampled from each house once a month, from June to December 2014. Prior to PSC, the inhabitants were instructed to empty the house, any openings that could allow mosquito escaping were closed and entire floor was covered with a white sheet of cloth made of cotton. Then a protected sprayer (person) sprayed the room with Mobil flit (Bioygon SC, Jonhanson and Sun. Inc. USA) for about 5 min and left closed for 15 min. Subsequently, the sheet was brought outside the room and knockdown mosquitoes were inspected and non-anopheline mosquitoes such as Culex were identified visually using key characters such as wing and abdominal appearance. The abdominal status of all collected mosquitoes were observed with exception of Culex samples and sent to Asendabo Field Vector Biology of Jimma University, Jimma for further morphological identification using standard keys,. Following the guidelines of WHO the blood meal digestion stages of female Anopheles collected by LTCs and PSCs were identified by the help of hand lens and then grouped as unfed, freshly fed, half-gravid, and gravid. The unfed and freshly fed groups were used for ovary dissection, for determining the parity rate and longevity of mosquitoes. Fed and gravid specimens of An. gambiae s.l., An. pharoensis and An. coustani were preserved on silica gel. Head and thorax region of unfed and parous An. gambiae s.l. were also preserved on silica gel for circumsporozoite protein (CSP) detection along with the fed and gravid specimen of this species. Ovaries of unfed anopheline mosquitoes collected by LTCs method were dissected, following specimen identification at species level, and abdominal status detection after immobilization using chloroform. Briefly, the legs and wings of a mosquito were removed, and then placed on a slide in a drop of phosphate buffer saline solution (PBS). While holding one dissecting needle on the thorax, under a dissecting microscope, the ovaries were removed by breaking the abdominal wall in the region of the 7th to 8th sclerite, and then by pulling the tip of the abdomen away from the rest of the body with a second needle held in the right hand. Then the two lobed ovaries were separated and allowed to air dry and liquid if any was absorbed using filter paper. The ovaries, were examined for ovary tracheoles under compound microscope using the 10x objective, and when necessary, a confirmation was made using 40x objective. The ovaries in which the terminal skeins of the tracheoles had become uncoiled were considered to be parous, while the ovaries with coiled skeins were considered to be nulliparous. Head-thorax of unfed parous, fed, half-gravid and gravid specimens of An. gambiae s.l. collected by LTCs and PSCs was used for CSP detection. The head-thorax of a mosquito was removed with a sharp clean surgical blade on filter paper and then transferred to labeled eppendorf tube of 1.5 ml by clean forcipes; while the rest parts of the mosquito were preserved for further study. Then 50 μl of blocking buffer (BB) containing IGEPAL CA-630 (Sigma-Aldrich, USA) was added to each of the sampled head-thorax; grinded and homogenized very well through vortexes, handshaking and using new non-absorbent plastic pestle. About 200 μl BB was added to each labeled eppendorf tube and kept in −20°C. About 50 μl of diluted capture monoclonal antibodies (MAb) (CDC, Atlanta, USA) was added to ELISA plates, and incubated for 1 h at room temperature. Then the capture MAb was aspirated by multichannel pipettes and completely drained by banging plates sharply on an absorbent tissue paper to ensure complete dryness. Following this, each well was completely filled with BB and incubated for 1 h at room temperature. The plates with BB were then aspirated using multichannel pipettes and the remaining buffer droplets were drained again by banging plates sharply on an absorbent tissue paper. About 50 μl of positive control (recombinant protein antigen, CDC, Atlanta, USA) and 50 μl (per well) of the negative controls (homogenate of laboratory reared female An. gambiae s.l.) were added in the first two column of each plate. Then, 50 μl of each mosquito homogenate was loaded to the remaining wells of the plate, with careful crosschecking of the correct correspondence of codes between the plate wells and labels on each eppendorf tube containing the homogenate. Then the plate was covered with aluminum foil and incubated for 2 h at room temperature in subdued light. The homogenate was then removed and the wells were washed twice with 150 μl PBS-Tween 20 through filling and emptying. Then 50 μl Peroxidase-conjugated MAb was added and incubated for 1 h at room temperature. The enzyme conjugate from the wells were aspirated and washed three times with PBS-Tween 20. Then about 100 μl of 2,2'-Azino-bis(3-ethylbenzthiazoline-6-sulfonic acid) (ABTS) (Sigma-Aldrich, USA) substrate per well was added to each well and incubated for 30–60 min. Appearance of dark green colour marked positive reaction as described in a study by Wirtz et al. Lastly, the results of each tested mosquito sample were recorded. The sporozoite rates were calculated as the proportion of mosquitoes containing malaria sporozoite antigen to the total samples tested by ELISA. Mean monthly rain fall, relative humidity and temperature were obtained from the Southwestern branch of Regional Office of the Ethiopian Meteorological Agency, Ethiopia. Permission from the district and respective village authorities for the study was obtained. Both verbal and written informed consent was obtained from the head of the households selected for the study for carrying out the mosquito collection. Density data were cleaned then log-transformed in SPSS and also tested for normality before analysis using SPSS software version 16 (SPSS Inc, Chicago, IL, USA). The significance test was done assuming p < 0.05 for the analysis. Multiple mean comparisons were done by oneway ANOVA. For significant ANOVA, means were separated using Tukey’s Post-hoc test. Correlation coefficient was used to determine the monthly mean density of An. gambiae s.l. along with rain fall, relative humidity and minimum monthly temperature. Student’s t-tests were used to analyze differences in indoor and outdoor biting activities. 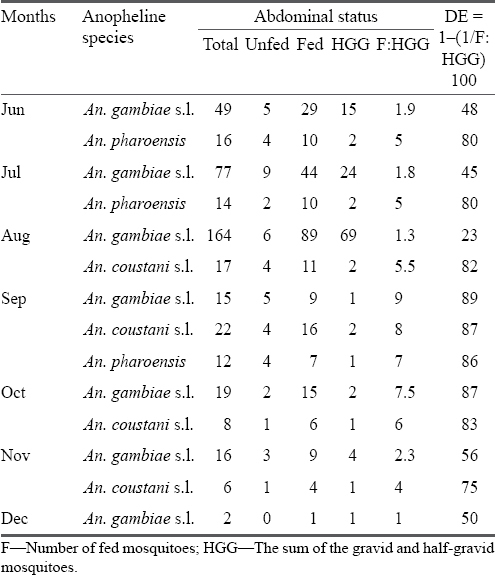 Degree of exophily (DE) was calculated as described by Ameneshewa and Service: DE = 1-(1/F:HGG) 100, where, F is the number of fed mosquitoes and HGG is the sum of the gravid and half-gravid mosquitoes collected by PSCs to determine rates of exophilic behaviour of collected mosquito species. 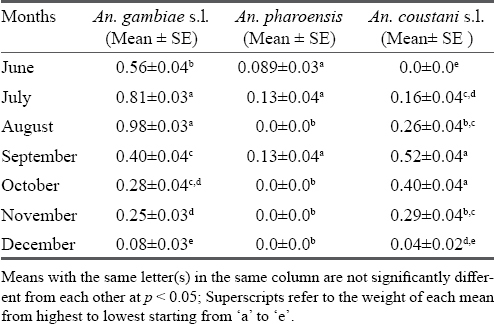 Parous rates (PR= P/NE), daily survival rate ( ) and longevity (L= 1/−ln p) of Anopheles mosquitoes were determined following formulas developed by Detinova; where, P=Number of parous mosquitoes detected, NE=Total number of mosquitoes examined; and gc=Estimated gonotrophic cycle. Sporogonic cycle and duration of sporogony were calculated following method developed by WHO. The sporozoite infection rate of An. gambiae s.l. was expressed as the proportion of mosquitoes containing malaria sporozoite proteins out of the total samples tested by ELISA. In total, 1559 adult female anopheline mosquitoes representing at least three species were collected during the study period, from the nine study villages [Table 1]. Of these 1122 anopheline mosquitoes were collected by LTCs and the rest 437 were collected by PSCs. Anopheles gambiae s.l. (71.8%) was observed as the most abundant species, followed by An. coustani s.l. (22%) and An. pharoensis (6.2%). Anopheles gambiae s.l. and An. coustani s.l. were found in all the study villages. Comparison of mosquito density among villages showed that there was no significant difference in mean density of An. gambiae s.l. (F(8,117) = 0.32, p = 0.96) and An. coustani s.l. (F(8,117) = 0.46, p = 0.89). In contrast, mean density ofAn. pharoensis among study villages was significantly different (F(8,117) = 8.10, p = 0.0) in distribution [Table 2]. There was significant difference in mean monthly density of An. gambiae s.l. (F(6,119) = 84.27, p = 0.0), An. pharoensis (F(6,119) = 6.99, p = 0.0) and An. coustani s.l. (F(6,119) = 28.58, p = 0.0). The highest mean density of An. gambiae s.l. was in August, and least in December 2014. Mean density for An. coustani s.l. was highest during September and October 2014 [Table 3]. [Table 4] shows indoor and outdoor mean monthly density of An. gambiae s.l., An. pharoensis and An. coustani s.l. Overall, the mean monthly indoor density of An. gambiae s.l. was significantly higher (t(1,125)=2.28, p = 0.023) than the mean monthly outdoor density. However, mean outdoor density of An. gambiae s.l. was higher than mean indoor density during September and October 2014. Out of 342 An. gambiae s.l. mosquitoes collected during the study period, 196 were fed specimens while 116 were half-gravid and gravid. Higher number of fed and half-gravid An. gambiae s.l. specimens were documented in months between June and August and lower degree of exophily (23–48%) was recorded in the aforementioned months. Higher degree of exophily was recorded in months of September (89%) and October (87%), right after the spray campaign. However, the trend of exophily was reversed to lower rate in the following months, i.e. November (56%) and December (50%). Degree of exophily for An. pharoensis and An. coustani s.l. however, was higher throughout the intervention period [Table 5]. [Table 6] shows the monthly parity rates, longevity of An. gambiae s.l. 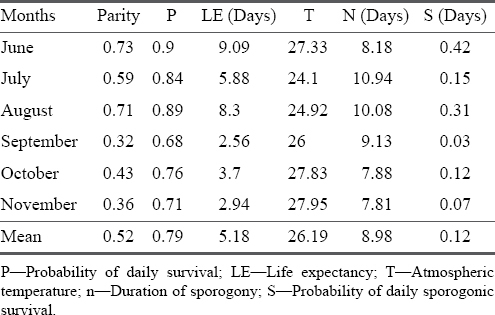 and probability of sporogonic survival of P. vivax among study villages. Vector mosquitoes showed longer life span in months June, July and August. In contrast, they lived shorter life in months September, October and November. The highest probability of daily sporogonic survival of P. vivax was observed in June and August with 0.42 and 0.32 days, respectively, while the lowest was September (0.03 days). Infectivity rate of An. gambiae s.l. Of 192 An. gambiae s.l. tested for Plasmodium parasite species CSP by sandwich ELISA, two mosquito specimens were found positive for P. vivax 210 polymorphs with infectivity rate of 1.04%. One of these two positive specimens was collected in LTCs in the month of June, while the other was collected in PSCs in August 2014. Kersa district in Ethiopia has been reported to be highly malarious area,. In the present study An. gambiae s.l. was recorded from all the study villages and the highest density was recorded in July and August 2014 which are the months of long rainy season. Rainfall, relative humidity and temperature favoured the density of An. gambiae s.l. in the present study, similar to the phenomena reported in a study in Kenya, which indicated that the rainy months presents favourable environmental conditions that enhance mosquito breeding and survival, through the proliferation of larval habitats and improved humidity. Similarly, other studies from Nigeria encountered higher numbers of mosquitoes in the rainy months,. Anopheles coustani s.l. (some of its sibling species like An. tenebrosus incriminated as suspected secondary vectors) was also abundant next to An. gambiae s.l. in the study villages. The study villages Sarado, Digo and Ankaso, where An. pharoensis was exclusively recorded were characterized by permanent water body (Gilgel-Gibe River, Awetu Rivers, Boy pond, and irrigated areas). Interestingly, this species which is considered as a secondary vector in Ethiopia, has been reported from other similar environments like near Awero and Baro Rivers in Gambella, southwestern Ethiopia,. This indicates that this species prefers to breed in permanent water bodies with emergent vegetation. Anopheles gambiae s.l. in the present study showed endophagic behaviour, similar to that report of an entomological assessment in Gambella region and Mwea, Kenya. In contrast, to the present finding, Kibret et al, Woyessa et al and Tirados et al documented that this species fed more predominantly in outdoors than indoors in Zeway, Central Ethiopia, Akaki and in Konso, southwestern Ethiopia respectively. Oyewole et al in a study carried out in Nigeria have also reported that population of An. gambiae s.l. species prefer outdoor feeding. Ameneshewa and Service have reported that indoor and outdoor biting behaviour of An. arabiensis in Gergedi Upper Awash, central Ethiopia depends strongly on the availability of hosts. However, in this study, the outdoor density of An. 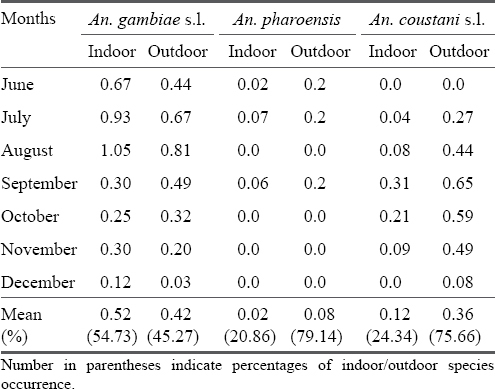 gambiae s.l., were significantly higher than indoor density in September and October 2014 post-IRS operation. This could be attributed to behavioural avoidance of an insecticide,,,. This higher outdoor density of the population of An. gambiae s.l. post-IRS operation may enhance outdoor malaria transmission by increasing human-vector contact, as the local people spend the evening outdoor with their cattle/villagers or the families gather together and discuss while chewing Khat (Catha edulis). The other two anopheline species documented in this study (An. pharoensis and An. coustani s.l.) showed exophagic feeding behaviour, similar to the findings of different studies from Ethiopia, East Africa and Cameroon, West Africa that demonstrated strong exophagic behaviour of An. pharoensis and An. coustani s.l.,,,. Mosquito species varies in their preference of resting places. The resting behaviour of anophelines has been shown to be flexible and affected by various factors like vector management methods applied and climate variabilities,,. The present study recorded a reduced endophilic preference of An. gambiae s.l. post-IRS intervention. This could be due to irritant and excito-repellency effect of the insecticide sprayed. In Tanzania, most of the An. arabiensis were found to exit-trap from DDT-sprayed houses just after blood meals, compared to houses that were sprayed with lambdacyhalothrin from which they left without taking blood meals. A study conducted in the Rift Valley of Ethiopia revealed that 43.6% of blood meal-fed An. arabiensis exiting the DDT sprayed houses showed exophilic behaviour. Resting behaviour of vector is one of the most important factors that determines the efficacy of IRS. Unfortunately, An. arabiensis, the principal vector of malaria in Ethiopia, is partially exophilic and, thus, poses a greater challenge to malaria control efforts relying on IRS. During pre-IRS intervention An. gambiae s.l. population was observed to show endophilic behaviour. Charlwood et al in their study carried out in Tanzania and Maedot et al from Eritrea related the increased endophilic behaviour of malaria vectors with increased rainfalls. Fornadel and Norris from Zambia indicated that increased endophily of An. arabiensis could be attributed to colder or wetter than normal weather which might force indoor fed mosquitoes to rest indoor. Long-term use of DDT in IRS was observed to enhance the behavioural resistance of this species. The shortest life span of An. gambiae s.l. in September, suggests that the IRS operation might have impact on the longevity of the vector species. Another possible reason for the low parity rate in late dry season of the year would be the low temperature and relative humidity. In the present study, An. gambiae s.l. showed higher parous rate and longevity during June, July and August months. Similarly, another study has reported higher parous rates for An. arabiensis in rainy months. The findings of this study showed that the infectivity rate of An. gambiae s.l. was low (only 1.04%). Earlier studies in Ethiopia also indicate low infectivity rates for the principal malaria vector, An. arabiensis, e.g. sporozoite rates of 1.18 and 1.1% were reported for An. arabiensis from Sille and Arbaminch city by Habtewold et al and Taye et al, respectively. Similarly, Oyewole et al reported 2.5% sporozoite rate for An. arabiensis in tropical rain forest of Nigeria. Shililu et al also reported 6.3% sporozoite rates for An. gambiae s.l. in western Kenya. A CSP negative result in An. gambiae s.l. after IRS intervention might be due to the shorter life expectancy of the vector species; which implies that, the longer the life expectancy, the higher the probability of malaria parasite to reach an infective stage. In conclusion, the most predominant malaria vector recorded in the study area is An. gambiae s.l., the principal malaria vector in Ethiopia. Higher density of An. gambiae s.l. was recorded outdoor in September month from all study villages. The fed to gravid ratio of An. gambiae s.l. was higher after IRS operation; indicating that the species tended to avoid the insecticide and rest outdoor due to induced pressure. Higher density and longevity of An. gambiae s.l. was observed in the early months of the wet season (June, July and August) pre-IRS intervention. The lowest daily survival rates and therefore shorter longevity of An. gambiae s.l. in September shows the impact of IRS operation. Thus, the results of the study could contribute to the understanding of anopheline mosquitoes, i.e. their composition, dynamics, distribution, life expectancy, behaviour and infectivity rates in the study area which could be used in evidence based malaria vector control programmes. The authors declare that they have no any conflict of interests. The authors acknowledge the Jimma University, Jimma, Ethiopia for the financial support and laboratory space provision. World Malaria Report 2016. Geneva: World Health Organization 2016. Available from: http://who.int/malaria/publications/ world-malaria-report-2016/report/en. (Accessed on July 9, 2017). World Malaria Report 2015. Geneva, Switzerland: World Health Organization 2015. Available from: http://who.int/malaria/publications/world-malaria-report-2015/report/en/ (Accessed on June 4, 2016). Bloland PB. Drug resistance in malaria: A background document for the WHO global strategy for containment of antimicrobial resistance. WHO/CDS/CSR/DRS/2001.4; Geneva, Switzerland: World Health Organization 2001; p. 27. Chibsa S. Malaria vector control efforts and challenges in Ethiopia. IV Win Meeting, Basel, Switzerland, Oct 24–26, 2007; p. 1–35. Available from: https://pdfs.semanticscholar.org/6a84/5ba4089d9fa49e7c89861d1bc1fe2108fc0a.pdf (Accessed on June 4, 2016). Guideline for malaria vector control in Ethiopia. Addis Ababa: Malaria and other Vector Disease Prevention and Control Team, Disease Prevention and Control Department, Ministry of Health 2002. Corradetti A. The epidemiology of malaria in the region ullo–jeggiu (Africa oriental Italian). Rev Malar 1940; 2: 101. Giaquinto-Mira. Note on the geographical distribution and biology of “Anophilinae” and “Culicinae” in Ethiopia. Riv Malariol 1950; 29(5): 281–313. Fontaine RE, Najjar AE, Prince JS. The 1958 malaria epidemic in Ethiopia. Am J Trop Med Hyg 1961; 10: 795–803. Rishikesh N. Observations on anopheline vectors of malaria in an unsprayed upland valley in Ethiopia. World Health Organ Rep 1966; p. 1–28. Available from: http://apps.who.int/iris/ bitstream/10665/65327/1/WHO_Mal_66.554.pdf (Accessed on May 3, 2015). Krafsur E. The bionomics and relative prevalence of Anopheles species with respect to the transmission of Plasmodium to man in western Ethiopia. J Med Entomol 1977; 14(2): 180–94. Hailemariam LR. Improving efficiency, access to and quality of the rural health extension programme in Tigray, Ethiopia: The case of malaria diagnosis and treatment. Umeå, Sweden: Print and Media, Umeå University 2012; p. 48–55. Deressa W, Olana D, Chibsa S. Community participation in malaria epidemic control in highland areas of southern Oromia, Ethiopia. Ethiop J Health Develop 2005; 19(1): 3–10. Negash K, Jima D, Nafo-Traore F, Mukelabai K, Banda J, Medhin A, et al. Ethiopia roll back malaria consultative mission: Essential actions to support the attainment of the Abuja targets. Addis Ababa, Ethiopia: Ethiopia RBM Country Consultative Mission Final Report 2004; p. 39. Health sector development programme IV (2010/11-2014/15). Addis Ababa: Ethiopian Federal Ministry of Health 2010. Available from: https://www.google.com/url?sa=t&rct=j&q=&esrc= s&source=web&cd=1&cad=rja&uact=8&ved=0ahUKEwjkm O3zuJjWAhVFNiYKHcQrDCoQFggnMAA&url=http%3A%2F %2Fwww.nationalplanningcycles.org%2Fsites%2Fdefault%2 Ffiles%2Fcountry_docs%2FEthiopia%2Fethiopia_hsdp_iv_final_draft_2010_-2015.pdf&usg=AFQjCNFYw6-eT6F6pGGx-VxXP4M4KbQKSfA; p. 1–114 (Accessed on July 9, 2017). President’s Malaria Initiative. Ethiopia: Malaria Operational Plan (MOP) FY 2008. Available from: https://www. google.com/url?sa=t&rct=j&q=&esrc=s&source=web&c d=1&cad=rja&uact=8&ved=0ahUKEwjIv62DvpjWAhUJ ORoKHSXrAZcQFggnMAA&url=https%3A%2F%2Fwww. pmi.gov%2Fdocs%2Fdefault-source%2Fdefault-document-library%2Fmalaria-operational-plans%2Ffy08%2Fethiopia_mop-fy08.pdf%3Fsfvrsn%3D6&usg=AFQjCNF-TKIml3uWGt-8414n5f3Ebftwukg; p. 1-–62 (Accessed on July 9, 2017). President’s Malaria Initiative. Ethiopia: Malaria Operational Plan (MOP) FY 2014. Available from: https://www.usaid.gov/ sites/default/files/documents/1864/Ethiopia%20Malaria%20 Operational%20Plan%20FY%202014.pdf; p. 1–74 (Accessed on July 9, 2017). Abose T, Yeebiyo Y, Olana D, Alamirew D, Beyene YA, Regassa L, et al. Re-orientation and definition of the role of malaria vector control in Ethiopia: The epidemiology and control of malaria with special emphasis on the distribution, behaviour and susceptibility of insecticides of anopheline vectors and chloroquine resistance in Zwai, central Ethiopia and other areas. Geneva: World Health Organization 1998. WHO/Mal/1085. Ketema T, Bacha K, Birhanu T, Petros B. Chloroquine-resistant Plasmodium vivax malaria in Serbo Town, Jimma zone, southwest Ethiopia. Malar J 2009; 8:177. Bloland PB. Drug resistance in malaria: A background document for the WHO global strategy for containment of antimicrobial resistance. WHO/CDS/CSR/DRS/2001.4. Geneva, Switzerland: World Health Organization 2001; p. 27. Yewhalaw D, Wassie F, Steurbaut W, Spanoghe P, Van Bortel W, Leen Denis, et al. Multiple insecticide resistance: An impediment to insecticide-based malaria vector control program. PLoS One 2011; 6(1): e16066. doi:10.1371/journal.pone.0016066. Yewhalaw D, Bortel VW, Denis L, Coosemans M, Duchateau L, Speybroeck N. First evidence of high knockdown resistance frequency in Anopheles arabiensis (Diptera: Culicidae) from Ethiopia. Am J Trop Med Hyg 2010; 3: 122–5. Balkew M, Ibrahim M, Koekemoer LL, Brooke BD, Engers H, Aseffa A, et al. Insecticide resistance in Anopheles arabiensis (Diptera: Culicidae) from villages in central, northern and southwest Ethiopia and detection of kdr mutation. Parasit Vectors 2010; 3(40): 3–6. Massebo F, Balkew M, Gebre-Michael T, Lindjrn B. Blood meal origins and insecticide susceptibility of Anopheles arabiensis from Chano in southwest Ethiopia. Parasit Vectors 2013; 6: 44. Abate A, Hadis M. Susceptibility of Anopheles gambiae s.l. to DDT, malathion, permethrin and deltamethrin in Ethiopia. Trop Med Int Health 2011; 16(4): 486–91. Balkew M, Getachew A, Chibsa S, Olana D, Reithinger R, Brogdon W. Insecticide resistance: A challenge to malaria vector control in Ethiopia. Malar J 2012; 11 (1): 139. Fettene M, Olana D, Christian RN, Koekemoer LL, Coetzee M. Insecticide resistance in Anopheles arabiensis from Ethiopia. Afr Entomol 2013; 21(1): 89–94. Yewhalaw D, Asale A, Tushune K, Getachew Y, Duchateau L, Speybroeck N. Bio-efficacy of selected long-lasting insecticidal nets against pyrethroid resistant Anopheles arabiensis from southwestern Ethiopia. Parasit Vectors 2012; 5: 159. Kitau J, Oxborough RM, Tungu PK, Matowo J, Malima RC, Bruce SJ, et al. Species shifts in the Anopheles gambiae complex: Do LLINs successfully control Anopheles arabiensis? PLoS One 2012; 7(3): e31481. Gatton ML, Chitnis N, Churcher T, Donnelly MJ, Ghani AC, Godfray CJ, et al. The importance of mosquito behavioral adaptations to malaria control in Africa. Evolution 2013; 67(4): 1218–30. Moiroux N, Gomez MB, Pennetier C, Elanga E, Djènontin A, Chandre F, et al. Changes in Anopheles funestus biting behavior following universal coverage of long-lasting insecticidal nets in Benin. J Infect Dis 2012; 206(10): 1622–9. Reddy MR, Overgaard HJ, Abaga S, Reddy VP, Caccone A, Kiszewski AE, et al. Outdoor host seeking behaviour of Anopheles gambiae mosquitoes following initiation of malaria vector control on Bioko Island, Equatorial Guinea. Malar J 2011; 10: 184. Durnez L, Coosemans M. Residual transmission of malaria: An old issue for new approaches. In: Prof. Sylvie Manguin, editor. Anopheles mosquitoes–New insights into malaria vectors. Croatia: InTech 2016; p. 671–4. Available from: https://www. intechopen.com/books/anopheles-mosquitoes-new-insights-into-malaria-vectors/residual-transmission-of-malaria-an-old-issue-for-new-approaches. doi: 10.5772/55925. Population and housing census of Ethiopia: Administrative Report, CSA-2012. Addis Ababa: Central Statistics Agency of Ethiopia 2007; p. 1–125. Gillies M, De Meillon B. The Anophelinae of Africa south of the Sahara (Ethiopian Zoogeographical Region). Johannesburg: South African Institute for Medical Research 1968; p. 54. Verrone G. Out-line for the determination of malaria mosquitoes in Ethiopia. Pt I: Adult female anopheline. Mosq News 1962; 22: 37–49. Manual on practical entomology Pt II: Method and techniques. Geneva, Switzerland: World Health Organization 1975; p. 1–186. Wirtz R, Zavala F, Charoenvit Y, Campbell G, Burkot T, Schneider I, et al. Comparative testing of monoclonal antibodies against Plasmodium falciparum sporozoite for ELISA development. Bull World Health Organ 1987; 65: 39–45. Ameneshewa B, Service M. Resting habits of Anopheles arabiensis in the Awash River Valley of Ethiopia. Ann Trop Med Parasitol 1996; 90: 515–21. Detinova T. Age-grouping methods in Diptera of medical importance, with special reference to some vectors of malaria. Monogr Ser World Health Organ 1962; 47: 13–191. Wondimu T, Aseffa M, Deboch B, Kassahun W. Community involvement and perception towards malaria prevention and control strategies in rural areas of Kersa district in Jimma zone, southwest Ethiopia. Ethiop J Health Develop 2007; 17(1): 1–10. Minakaw N, Sonye G, Mogi M, Githeko A, Yan G. The effects of climate factors on the distribution and abundance of malaria vectors in Kenya. J Med Entomol 2002; 39: 833–41. Olayemi I. Survivorship of Anopheles gambiae in relation to malaria transmission in Ilorin, Nigeria. J Health Allied Sci 2008; 7(3): 1–5. Oyewole I, Awolola T, Ibidapo C, Oduolad A, Okwac O, Obansad J. Behaviour and population dynamics of the major anopheline vectors in a malaria endemic area in southern Nigeria. J Vector Borne Dis 2007; 44: 56–64. Adugna N, Petros B, Woldegiorgis M, Tilahun D, Lulu M. A study of the status of Anopheles tenebrosus (Donitz, 1902) in the transmission of malaria in Sille, Southern Ethiopia. Ethiop Med J 1998; 12: 75–80. Muriu MS, Muturi JE, Shililu IJ, Mbogo MC, Mwangangi MJ, Jacob GB, et al. Host choice and multiple blood feeding behaviour of malaria vectors and other anophelines in Mwea rice scheme, Kenya. Malar J 2008; 7: 43. Kibret S. Petros B, Boelee E, Tekie H. Entomological studies on the impact of a small-scale irrigation scheme on malaria transmission around Zeway, Ethiopia. In: Awulachew S, Loulseged M, Yilma A, editor. Impact of irrigation on poverty and environment in Ethiopia. Proceedings of the Symposium and Exhibition held in Addis Ababa, November 27–29, 2007; p. 418–38. Woyessa A, Gebre-Micheal T, Ali A. An indigenous malaria transmission in the outskirts of Addis Ababa, Akaki Town and its environs. Ethiop J Health Develop 2004; 18(1): 2–7. Tirados I, Costantini C, Gibson G, Torr S. Blood-feeding behavior of the malarial mosquito Anopheles arabiensis: Implications for vector control. Med Vet Entomol 2006; 20: 425–37. Fetene M, Hunt RH, Coetzee M, Tessema F. Behavior of Anopheles arabiensis and An. quadriannulatus sp. B mosquitoes and malaria transmission in southwestern Ethiopia. J Afr Entomol 2004; 12(1): 83–7. Mnzava A, Rwegoshora R, Tanner M, Msuya F, Curtis C, Irare S. The effects of house spraying with DDT or lambdacyhalothrin against Anopheles arabiensis on measures of malarial morbidity in children in Tanzania. Acta Trop 1993; 54: 141–51. Antonio-Nkondjio C, Kerah CH, Simard F, Awono-Ambene P, Chouaibou M, Tchuinkam T, et al. Complexity of malaria vectorial system in Cameroon: Contribution of secondary vectors to malaria transmission. J Med Entomol 2006; 43(6): 1215–21. Taye A, Haddis M, Adugna N, Tilahun D, Wirtz R. Biting behavior and Plasmodium infection rates of Anopheles arabiensis from Sille, Ethiopia. Acta Trop 2006; 97: 50–4. Adugna N, Petros B. Determination of the human blood index of some anopheline mosquitoes by using ELISA. Ethiop Med J 1996; 34: 1–10. Nigatu W, Petros B, Lulu M, Adugna N, Wirtz R. Species composition, feeding and resting behavior of the common anthropophilic anopheline mosquitoes in relation to malaria transmission in Gambella, southwest Ethiopia. Int J Trop Insect Sci 1994; 15(3): 371–7. Fornadel CM, Norris DE. Increased endophily by the malaria vector Anopheles arabiensis in southern Zambia and identification of digested blood meals. Am J Trop Med Hyg 2008; 79(6): 876–80. Charlwood J, Kihonda S, Sama PF, Billingsley H, Hadji JP, Verhave E, et al. 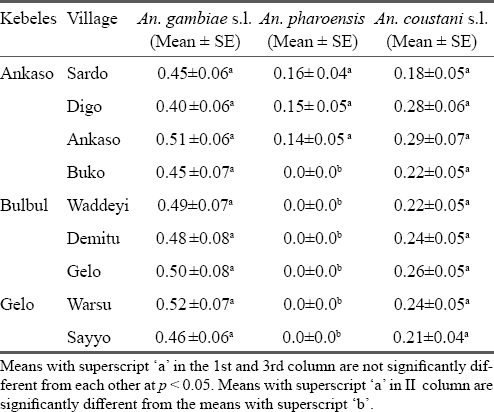 The rise and fall of Anopheles arabiensis (Diptera: Culicidae) in a Tanzanian village. Bull Entomol Res 1995; 85: 37–44. Maedot W, Richard J, Oluyomi A, Chris C. Transmission of malaria in the Tesseney area of Eritrea: Parasite prevalence in children, and vector density, host preferences, and sporozoite rate. J Vet Ecol 2005; 30(1): 27–32. Habtewold T, Walker A, Curtis C, Osir F, Thapa N. The feeding behavior and Plasmodium infection of Anopheles mosquitoes in southern Ethiopia in relation to use of insecticide-treated livestock for malaria control. Trans R Soc Trop Med Hyg 2001; 95: 584–6. Shililu J, Maier W, Seitz H, Orago A. Seasonal density sporozoite rates and entomological inoculation rates of Anopheles gambiae and Anopheles funustus in high altitude sugarcane growing zone in western Kenya. Trop Med Int Health 1998; 3(9): 706–10.